Listen to NABJDigital’s Hyperlocal Websites: Are They The Savior Of Local News? Dr. Michelle Ferrier, an associate professor at Elon University in the School of Communications. She is the developer of a demonstration project called LocallyGrownNews.com, a hyperlocal community platform and service model focused on local food conversations. She is also a steward in Journalism That Matters, helping to spark journalism entrepreneurship nationwide. Holly Edgell, one of two regional editors for Patch.com in Metro St. Louis where she is currently hiring 12 local editors, each of whom will be in charge of covering news for a community new website. Before joining Patch.com, Edgell taught journalism at the University of Missouri and Florida A&M University. She also worked as a television news producer in a number of cities, including Detroit, Cleveland and Pittsburgh. Shawn P. Williams is the founder, editor and publisher of the nationally acclaimed and highly recognized DallasSouthBlog.com now known as Dallas South in June of 2006 where he serves as publisher and editor. The website has been featured on NBC Nightly News, The Chicago Tribune, CNN, NPR, BBC, and many other national outlets and is designed to promote positive images of African-Americans in the media. Mike Green is a journalist-turned-entrepreneur with 14 years experience in media. He’s a New York Times Leadership Academy Fellow with training at CNN.com and he led award-winning online experiments in local community engagement for the Dow Jones Local Media Group. We had a spirited and informative discussion on future directions of hyperlocal websites. You can listen to the complete show here. Editor’s note: please join the National Association of Black Journalists’ Digital Journalism task force for our next BlogTalkRadio chat – “Hyperlocal Websites: Are They The Savior Of Local News?” – tonight, Tuesday, Sept. 28 from 8:00-9:00 p.m. Eastern time. Click here for more details. I hope you can join us! 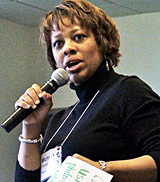 Dr. Michelle Ferrier is an associate professor at Elon University in North Carolina, where she teaches in the iMedia graduate program. She was one of the chairs of the Journalism That Matters conference, held in Detroit in June that focused on entrepreneurialism in journalism. Ferrier is the creator of LocallyGrownNews.com, a hyperlocal website focused on allowing citizen journalists and community members to “focus on what they are most passionate about – building their community conversation through good local information and networking.” The website is an online community and mobile application designed to foster conversations around the locavore movement and uses the eating locally movement to generate conversation around sustainable, healthy lifestyles. NABJDigital: How did you come up with the idea for LocallyGrown News? Michelle Ferrier: The original idea came out of the McCormick Foundation’s New Media Women Entrepreneur proposal for grants. I created a project that provided tech, content, shared marketing and shared promotion systems to create small hyperlocal online communities run by women. ND: Why did you think there was a need for a website like this? MF: I felt this system was needed. I wanted a way to package all the things an entrepreneur would need to get started. It was actually born out of survivor’s guilt. I created this online community – MyTopiaCafe.com – at a legacy newspaper. I left after several rounds of layoffs. A week after I left, my whole team was laid off. I wanted to support those laid-off workers and create something similar for them. ND: How does LocallyGrownNews.com work? MF: First, those interested in developing a website can contact me. We did a soft launch in May. We started by developing sites in Greensboro and Winston-Salem, N.C., to see what it would be like and test the technologies used. This is a women’s community news franchise and we picked this topic to start because of the growth in local food movements. Local food will increasingly get more attention in creating jobs to grow local economies. ND: What in your background do you think led to the creation of LocallyGrown News? MF: I had three majors in college. I started out in engineering, which gave me the computer science I needed. Then I went into business, where I got accounting and marketing knowledge. Finally, I went to journalism. All three gave me a good base for a future as an entrepreneur. ND: You won a grant from the McCormick Foundation. How important was that funding for LocallyGrown News? MF: The grant was for $10,000, which was used to cover development costs. Those costs alone for can be staggering. I looked at existing platforms, both free and charged. But to really develop the online community I wanted, I would have to build my own platform, and that seed money helped me create my vision. The content management system itself is extremely robust. It runs on an engine that some newspapers run. It’s a very robust platform for print export that you won’t find on Blogger or WordPress. It’s not a blog. If someone is looking for a comparison, it’s a mashup of Facebook, WordPress and online news sites. ND: What advice would you give to others who might want to apply for this grant in the future? MF: One, you have to be very comfortable with your vision and promoting that vision. In order to be able to talk to anyone about your idea — like venture capitalists and foundations — you have to have a clear idea of what you’re doing, why and who you’re serving. My goal from the start was to ensure that laid-off female employees have an advantage in the market for entrepreneurship, and provide them with a product they can work with. Be passionate about what you’re doing. I’m committed to women entrepreneurs, local foods and local communities, and am making that commitment. I am committed beyond financial enrichment for myself. ND: Why do you think that journalism entrepreneurship has become so prevalent in conversations on where our industry is growing? MF: One, because I think traditional legacy media have been retrenching as new and entrepreneurial activities grow. In terms of innovation and products, some are doing that, but some have lost that innovation spark. We want to offer opportunities after layoffs and severance packages. Journalists have a set of skills that can serve a community, but no outlet to do it. The market is ripe for these opportunities now. Technologically, tools are way more sophisticated now than when online communities were first developed. Communities and management systems are so much more sophisticated. The cost and other barriers to entry are significantly lower, so it’s a great time to consider entrepreneurial journalism projects and apply them to online media. ND: You’ve announced plans to expand LocallyGrown News. Who is the ideal person to take on growing this site? MF: That person would be either working part time in legacy media or freelancing. We’re looking at females with a broad journalist background. We want someone that has the desire to grow and own a business, someone with hustle to make things happen. Those people also have experience with consulting and can do marketing. On a good day, our footprint is smaller than a county area, so we need someone who can provide niche content and also has an interest in eating good food. But it’s also broader that just food – we’re also looking at sustainable, economic living with a focus on food. We offer opportunities for advertising and revenue that are untapped. ND: How important has social media been in promoting the Locally Grown News websites? MF: We have a Facebook fan page to cultivate a different audience for those who want LocallyGrownNews.com in their neighborhood. I’m using Delicious to curate and archive articles for a user library of resources. I use Constant Contact to push out email newsletters each week. I use Google Analytics and the Open X ad server management system to manage ad campaigns on the site. We’re adding new tabs that are resources, including using Google Maps to show a directory of farmers markets. Our site allows readers to create a profile so people can see them across the community, a comment function, social bookmarking to push content and a Rate This function. Media Bistro is holding an online course – TV News Writing – on Wednesdays from Sept. 27 through Oct. 25. At the end of the course, students will have at least eight samples of your television news writing, including a reader, several voiceovers, and numerous packages that follow the format for TV news stories. The cost is $350. Columbia University Journalism Professor Sree Sreenivasan will hold a four week-course entitled “Smarter Social Media for Journalists, Bloggers and Media Professionals.” Scheduled for Thursdays, October 7, 14, 21, 28, 2010; 6:30 – 9 p.m., the course will teach participants how to use social media, including sites such as Twitter, Facebook, LinkedIn, FourSquare, YouTube, among others, to find new story ideas, trends and sources; connect with readers and viewers in new ways; bring attention and traffic to their work; and create, craft and enhance their personal brand. The cost is $495. DJTF member Tiffany Black will be holding an online course — Advanced Social Media – on Wednesdays from Oct. 20 through Nov. 17. Participants should be ready to dive into a class filled with practical, actionable tips and case studies on using Twitter, Facebook, LinkedIn, and Google Buzz. The cost is $350. Nov. 1 is the deadline to apply for the Donald W. Reynolds National Center for Business Journalism’s Strictly Financials Fellows 2011 program. The Reynolds Center is offering fellowships worth $2,000 for four days of intensive study in financials and accounting Jan. 4-7, 2011, in Phoenix at the Walter Cronkite School of Journalism and Mass Communication. Fellowships cover the full cost of training, lodging, materials and most meals. In addition, fellows receive a $500 stipend to help offset travel and other costs. This seminar will cover the essentials of covering financials, from stock markets and bonds to financial statements and company research. The Social Media Club is holding Social Media University Nov. 10-12 in Orlando. Learn from a dozen of the true Social Media Masters in this deep dive for Social Media Professionals. The cost is $395 for members and $500 for non-members through Sept. 30. On Oct. 1, the price goes up to the full retail price of $495 for members and $595 for non-members. The Donald W. Reynolds National Center for Business Journalism is holding an online webinar “Writing Business News for the Web: Online” Dec. 1-2. The webinar, taught by Pulitzer Prize-winner Jacqui Banaszynski, will help writers and editors write with clarity, efficiency, brevity and transparency. Participants will study story approaches and language use that enhance the readability of Web copy. The Knight Digital Media Center has spaces for 20 fellows at its Interactive Census Hands-On Workshop Dec. 12-17 at the University of California-Berkeley. KDMC is offering a customized visual storytelling workshop to train journalists on new ways to process data from the 2010 Census. Fellows will illustrate the information using visualization and mapping tools to create a clearer, more meaningful picture of the complex statistics gathered in the national survey. The Knight Digital Media Center at UC Berkeley has opened applications for its 2011 Multimedia Training Jan. 9-14 and May 15-20. The workshop offers intensive training that covers all aspects of multimedia news production; from basic storyboarding to hands-on instruction with hardware and software for production of multimedia stories. Participants will be organized into teams to report on a pre-arranged story in the Bay Area, and then construct a multimedia presentation based on that coverage. Applications are due by Nov. 19 for the January training and March 18 for the May training. The Knight Digital Media Center at UC Berkeley has opened applications for its Web 2.0 workshop Feb. 14-18 and June 13-17. This training takes participants through the progression of reporting news for multiple digital platforms, starting with quick text posts and moving through photos and video and finally ending with a full multimedia presentation. The workshop provides hands-on training using Twitter and Facebook for reporting and driving web traffic, creating data-driven map mashups, dynamically updating a blog for breaking news, publishing photo galleries and audio slideshows, producing videos and editing videos using Final Cut Pro. The deadline to apply is Dec. 10 for the February workshop and April 15 for the June training. Editor’s note: please join the National Association of Black Journalists’ Digital Journalism task force for our next BlogTalkRadio chat – “Hyperlocal Websites: Are They The Savior Of Local News?” on Tuesday, Sept. 28 from 8:00-9:00 p.m. Eastern time. Click here for more details. I hope you can join us! Today is my last day of a week-long multimedia training offered down here at the Poynter Institute in St. Petersburg, Fla. A post will be forthcoming on why you should consider Poynter training, especially if you belong to a minority journalist organization. Not only was the course very informative, I met a great bunch of journalists who were already doing amazing things and will do even more after this training. So this post is for Zack, Burt, Laura, Gudni, Sandra, Jerrita, Beatriz Melissa Pat, Lynette, Meena, Josee and Carol, with a special shout out to Alex, Al, Regina and Jeanne. Enjoy! Poynter Online – 10 Ways Journalism Around The World Is Being Revived And Reinvented. What kind of person would I be if I didn’t include an entry from here? Plus we had a student from Iceland and a student from Spain with some great insight on what’s going on in the field there. Journal Local – Useful Android Apps For Journalists And Bloggers. During the week, we had several lively discussions on iPhone versus Android for journalists. I didn’t realize Androids did so much; I might have actually re-though my decision to buy an iPhone! Multimedia Shooter – iPhone: A Storyteller’s Most Valuable Tool. Plus Apps And Gear You Gotta Have. Considering I’ve just completed multimedia training and I have an iPhone, it just made sense to see what’s out there that lets me shoot fairly good video and other tricks. One of our guest lecturers for this course was multimedia journalist Alex Garcia of the Washington Post. She did a presentation on “Why I Love Multimedia Storytelling,” and this story — The Healing Fields — illustrates that particularly well. Have a great weekend!! One look at crowd-sourced citizen journalism sites like CNNGo or iReport, and you’ll realize that the future direction of journalism is deeply embedded in social media as a means of quickly disseminating news and information. From sharing articles on Facebook to reaching tourism boards and other travel contacts via Twitter, as a professional writer, editor, and photographer, I can’t extol the benefits of social media enough when used appropriately, nor can I deny how crucial it can be to building certain page and visibility rankings needed to boost your business. Social media has become a part of our daily lives. From quickly asking for restaurant recommendations on Twitter to finding your long lost best friend from kindergarten, this new way of networking, building your online voice, and sharing information has created a society of 24-7 constant interaction with friends, family, and colleagues. But is this constant interaction productive? How does one carve out time to tap into one’s creativity and actually produce solid content when staying off social media for a few days also creates a feeling of disconnect? Many writers head to secluded retreats where they produce and flow without constant noise and distraction. This need to steal away to find inspiration and create new work has been around for centuries, yet in today’s constantly plugged in world, retreating can also be challenging because social media often acts as a source of inspiration too. Does sharing unnecessary gratuitous details about your scrumptious breakfast on Twitter or posting questionable blackmail-worthy photographs on Facebook enhance your professional brand? Where does one draw the line between work and play when using social media tools? Personally, I use Facebook for connecting with family and friends, and sharing interesting articles I think they might enjoy. I use Twitter for sourcing out information quickly which I need for my work as a freelancer. If you do plan on using social media for both work and play, it’s advisable to dedicate a particular tool to one aspect of your life, and try to minimize overlap. As beneficial as social media is to daily business, its strength also remains its weakness; the fact that it plays on people’s social networking skills, creating a high school-like atmosphere of trying to belong and be noticed. Superlative lists like “top tweeters to follow” and “best blogs to read or else…” create an incessant need to constantly remain relevant, pulling attention from more important offline responsibilities. The more we rely on technological outlets for answers and solutions, the more we lose our basic human interaction skills. I recently edited an excellent article written by Spencer Spellman (www.carolinanomad.com) called “Technology and the Way We Interact While Traveling”. In the article, he discusses how constantly staying plugged in with social media affects the way we interact when exploring new places. As journalists, how are we listening for new stories? Are we still putting our noses to the ground, sniffing out untold stories? Are we excluding the face-to-face human element all together? The point of this article really isn’t to outline steps on how to balance your usage of social media tools, but rather, raise questions we should be thinking about when integrating social media into our lives. Everyone’s needs are quite different. For some, facilitating social interaction is their day job, for others, it’s a way to wile away time. So deciding how much you let social media influence your life is ultimately a personal decision. But a good rule of thumb would be this: if you’re constantly seeking validation online much more than you actually produce work wise, you might want to reassess your relationship with social media. Lola Akinmade is a widely published travel writer and photographer based in Stockholm. Her work has appeared in many major travel publications such as National Geographic Traveler, BBC, Vogue, – http://www.lolaakinmade.com/articles – and has received numerous awards and accolades – http://www.lolaakinmade.com/notables. She’s also an editor with the Matador Network – www.matadornetwork.com, and loves working with charity and nonprofit organizations as a photojournalist. She’s got a penchant for jumping in whichever country she travels to, and is currently attempting to learn Swedish. Editor’s note: please join the National Association of Black Journalists’ Digital Journalism task force for our next BlogTalkRadio chat — “Hyperlocal Websites: Are They The Savior Of Local News?” on Tuesday, Sept. 28 from 8:00-9:00 p.m. Eastern time. Click here for more details. I hope you can join us! The Donald W. Reynolds National Center for Business Journalism is hosting an online conversation with personal branding expert Dan Schawbel on Sept. 21. This free, live chat will run from 1:30-2:15 p.m. EDT. Schawbel, described by Fast Company as a “personal branding force of nature,” is the author of the bestseller, “Me 2.0: Build a Powerful Brand to Achieve Career Success.” Here the registration page where you can sign up. The Knight Digital Media Center at UC Berkeley is offering a customized visual storytelling workshop Dec. 12-17 to train journalists on new ways to process data from the 2010 Census. In this intensive six-day workshop, attendees will learn to create cutting-edge interactive graphics. The skills and tools you learn will benefit your newsroom and your career long after the census. The workshop is limited to 20. The Atlanta chapter of the Online News Association is holding a workshop – The Art of Community Storytelling – Sept. 23 at 6:00 p.m. at the Loft at Castleberry Hill. The Berkeley Graduate School of Journalism is holding Michael X Michael on Sept. 23, where authors Michael Lewis and Michael Pollan converse about writing, storytelling, books, and journalism. The event is a fundraiser for the school. Cost: General $125 (Program only); Supporters $500 (Reception and program); and Sponsors $1,000 (Reception, program, and dinner). The Society of Professional Journalists’ Digital Media Committee will present an evening of exploration into the much talked about topic of “hyperlocal journalism,” featuring editors from Patch.com, on Sept. 24 from 5:30 p.m. to 7:00 p.m. The event will be held at the Illinois Technology Association. The event is free, but seating is limited. Harvard University’s Berkman Center for Internet & Society & Kennesaw State University’s Center for Sustainable Journalism will hold a one-day seminar Media Law in the Digital Age Sept. 25. The cost is $69. City University of New York’s J-Camp is holding a workshop – 10 Tips for Taking Better Photos – Sept. 28 6:30-8:30 p.m. The workshop will help you discover dozens of photo tips, tricks and techniques. The cost is $39.00. Hacks/Hackers of Austin, Texas, will hold its first meetup Sept. 30 from 6-8 p.m. at Austin’s Pizza on the Drag. City University of New York’s J-Camp will be holding the course How To Organize Your Digital Life on Oct. 18. This event features: 12 new tools and tips for managing info overload, including “Inbox Zero,” Batching, Filtering & other Email Techniques. The cost is $29. The McCormick Foundation will hold its annual 2010 New Media Women Entrepreneurs Summit in Washington, D.C., Nov. 8. The event is a day-long gathering of women news creators and wannabe news creators. Registration is $30 and includes lunch. City University of New York’s J-Camp will be holding the course Video Storytelling Bootcamp Dec. 11-12. Learn the 7 Secrets to Producing a Winning Video Story. The course will feature hands-on learning led by top multimedia journalists. The cost is $450.00. Last week, I interviewed Joe Rubin of FundingPost.com, which brings together entrepreneurs looking for funding and investors looking for projects to fund. He was kind enough to put me in touch with Terry Hicks, vice president of the investment group at Ben Franklin Technology Partners of Pennsylvania and a founder of the Minority Angel Investor Network. While Hicks’ organizations focus on funding technology products and processes, including but not limited to hardware and software, drugs and medical devices, alternative energy and clean technology, I felt his general advice could still be very useful for journalists looking to fund their entrepreneurial projects. Ben Franklin holds informational seminars during the year on what we look for and our processes, says Hicks. “Folks who attend our seminars are advised on how to submit an application and what to expect during the review process,” he explains. “The success of the pitch, coupled with all the other information collected during our review process factor into the investment decision”, says Hicks. “It’s a very competitive process and my responsibility is to make sure, at end of the day, that we have a balanced portfolio that performs well, despite the early stage at which we invest. From the day an application is submitted for investment until the day of an approval is typically 12 to 15 weeks, which isn’t a long time when it comes to investment decisions”, he adds.